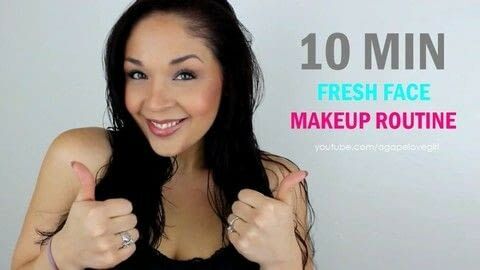 Hey beauty babes, Today I am sharing a video tutorial of my 10 Minute "Fresh Face" makeup routine. As a mom of 3 - I remember those days where sleep and personal time is almost non-existent! My kids are 13, 10 & 7 and pretty self-sufficient now. But there are still days where I wake up exhausted looking like death and The Hubs is rushing me out the door - and I've got to look presentable quickly. I think I have got a pretty good routine down. With just 10 minutes and little bit of effort I look fresh and awake. Keep in mind - some steps you may not need to do at all. 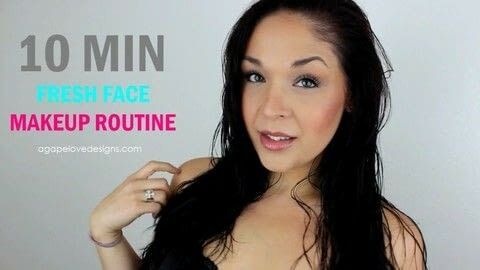 But this just gives you an idea of my own routine and what I feel helps me look the best on limited time! Some steps you can complete skip or change out - like adding bronzer. If I am in a big hurry - I will skip bronzer and only apply blush so I still look "alive" with a flush of color. Of course if I am skipping bronzer - I also skip the "clean up" with the Multi-Tasker Powder! Which saves more time too. Also - Maybe you dont need brow gel, or maybe you have great skin and can skip concealer and just use some powder! 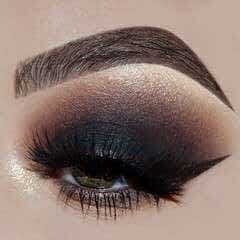 -Skip eyeshadow (just use your bronzer) - this saves time on getting out more products & tools! Listed are all the exact products I used in this video (for anyone curious). However, you can switch out any of these for your own personal favorites. These products change for me all the time. Sometimes I get on a kick with products and sometimes I just need something new! But honestly - whatever works for you, or whatever you already own - use it!